Norman Rockwell painted the “The County Agent” for the cover of Saturday Evening Post. The people pictured were an actual county agent, 4-H family and their hired man. Unusual summer rains didn’t dampen the 4th of July crowd’s spirit on DC’s National Mall! Declaration of Independence… July 4 or August 2? As we all know, the US Congress adopted the Declaration of Independence on July 4, 1776. However, even though independence had been declared, delegates to the Continental Congress had not yet signed the document. It wasn’t until August 2, 1776, that the Declaration of Independence became official. How old is the National 4-H Supply Service? Who was its very first customer and which 4-H products were the first items to be sold? You can find out inside. 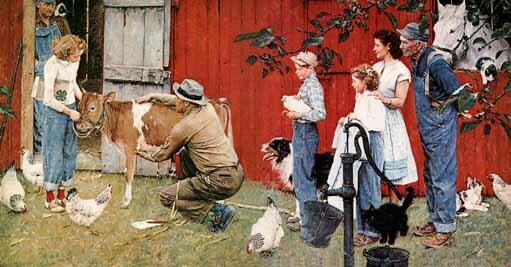 The iconic Normal Rockwell painting, “The County Agent”, illustrating 4-H projects of an Indiana farm family, was first published as a Saturday Evening Post cover. Can you guess the publication date? “Hands-on History” this month features photography, a great way to visualize the important and fun parts of your 4-H history. Though 4–H entered the international arena as early as 1935, it wasn’t until years later that the first exchange of farm youth took place. IFYE (International Farm Youth Exchange) was born in 1948. “2015 FilmFest 4-H” and “Map your 4-H History” highlight two examples of “Contemporary 4-H History,” current nation-wide programs that are now making 4-H History. The July 4th fireworks are over in this marvelously independent country and the 4-H summer season is underway. Amid the hard work and deserved fun, enjoy this issue! This entry was posted in 4-H History Preservation Newsletter, History and tagged 1890, 4-H History, IFYE, Norman Rockwell, Supply Service, The County Agent by NewsAdmin. Bookmark the permalink.